Pennsylvania Sedge - Carex Pensylvanica is an easily-grown perennial that is partial to full sunlight. And while many sedges love moist soils, this one prefers dense, well-drained soils. Mostly used for ground cover, the Pennsylvania Sedge forms loose tufts that grow 8" tall. The roots of the plant are dark brown. The plant also holds both male and female flowers. The Pennsylvania Sedge is found North from Quebec to Manitoba and South from Mississippi to Georgia. They often grow in a creeping manner around oak trees. Pennsylvania Sedge may plant in rockier soils providing there is decaying matter on top. Plants retain their evergreen color year round.Pennsylvania Sedge is a native of Canada and the United States and commonly planted for dry shade ground cover or underplanting for shade perennials. 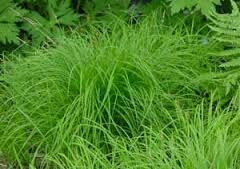 This sedge is easy to grow and deficient maintenance. Tolerating a fairly wide range of moisture conditions, this sedge is an excellent choice to plant in a rain garden, or for use as a lawn substitute in dry, shaded soils. A bright green during the growing months, this sedge has been known to be semi-evergreen in moderately cold winter climates. Typically in loose colonies with a tendency to creep. 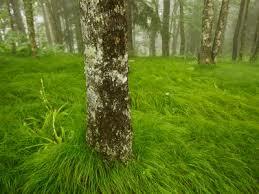 Commonly found in areas with oak trees, this species has also gained the name "oak sedge." Pennsylvania Sedge does best in partial to full shade and in dry to medium soil conditions, but can tolerate dense shade and wet soil. This sedge tends to prefer loose loams in dry soils, unlike most sedges which prefer moist to wet soils. Under optimal conditions, this sedge may self-seed, but is otherwise spread by rhizomes. For covering large areas, Pennsylvania Sedge - Carex Pensylvanica is suggested that it may be best to purchase plants, as this species often do not grow well from seed.